"Suk san wan pi mai!" a teenage boy hollered as he stretched forth his hand and smeared my face with talcum powder. And just like that, I lost my Songkran virginity to him in under 2 seconds. Love it or hate it, the whole of Thailand is transformed into an aqua playground from 13 - 15 April annually to celebrate the Thai New Year. Known as Songkran (derived from the Sanskrit word 'Sankranti' which means 'a move or change'), the water festival is the biggest event on the Thai calendar and the best time for any tourist hoping to soak in the kingdom's fascinating culture. Literally! 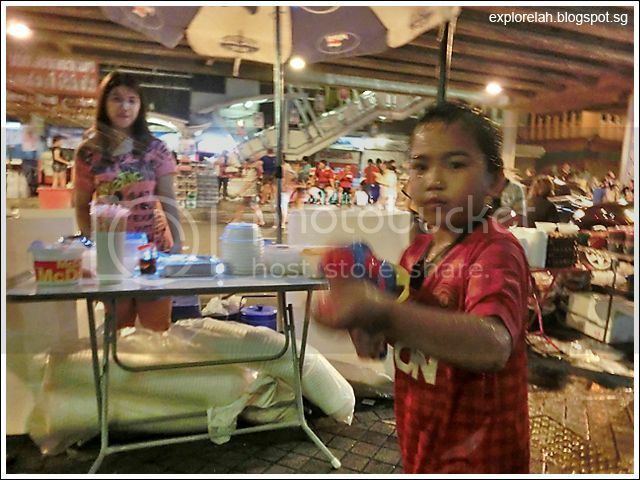 Splish splash at Chatuchak Weekend Market. With water squirting everywhere, it's as if Thailand has turned into one huge outdoor fountain! Songkran is celebrated over all the 4 administrative regions of Thailand with slight variants in observances, religious rites and scale, but water is central to the festivities. Water symbolizes the cleansing of the old self to reveal the new, and splashing someone with water is actually an act of blessing! 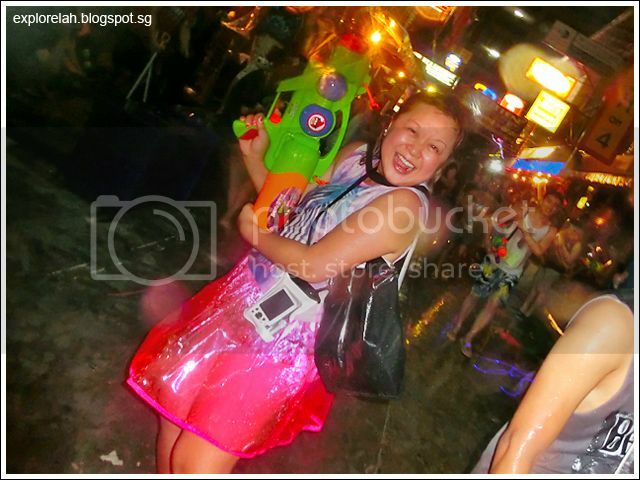 Songkran is the only time where you actually thank someone for drenching and making a mess of you. Starting with my teenage 'assailant', I lost count of the number of "kup koon krups" (thank yous) I said throughout the trip. 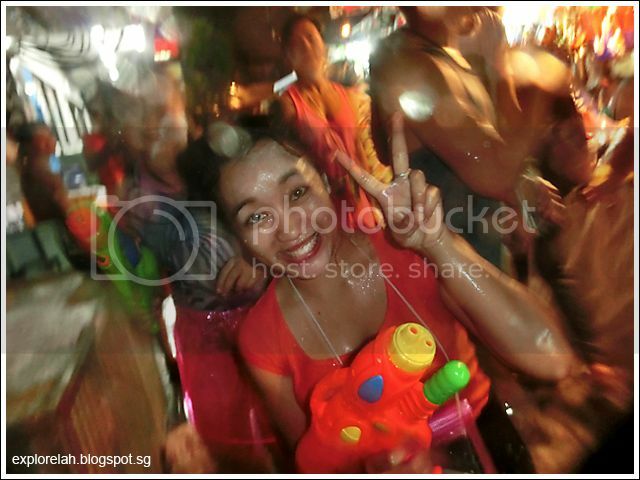 In the Southern region, Songkran is considered to be a time where the guardian angels of the Thais are renewed. The first day (13 Apr) is treated as a 'Farewell to the Old Angels' where the Southerners send off existing guardians. On the second day (14 Apr), alms are given to monks and prayers offered to Buddha and on the third, the Southerners 'Welcome New Guardian Angels' from heaven to take care of the Thai people for a year. For Thais in the Central region, the first day is called 'Maha Songkran Day', the second day is known as 'Wan Klang or Wan Nao' (Middle Day), and the last day named 'Wan Talerng Sok' (New Year Day). Religious ceremonies, alms giving, paying respect to ancestors, prayers and good deeds are performed throughout these 3 days. Songkran of the Northern Region is celebrated with a thorough cleaning of the home on the first day to welcome the new year. The second day is considered sacred and the Northerners are mindful not to speak bad words or ill of anybody, else the whole year will be cursed. On the third day, Northern Thais wake early to give alms and perform water-pouring ceremonies while receiving blessings from respected elders. The simplest celebration of Songkran is at the Northeastern region. Festivities start exactly at 3pm in the middle of the fifth lunar month. 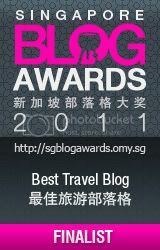 Hence, Songkran is also called 'Boon Duen Ha' (fifth month merit) in this region. Monks will hit drums to signal the start of the new year and villagers will pay respect to Buddha by offering perfume, incense, candles and flowers. After receiving blessings for the new year, the Northerners will pour water on elders and teachers before engaging in water splashing. Foreigners and locals become one. Songkran opens the floodgates to a holiday experience like no other. Although I've heard about the Water Festival, I was turned off by the prospect of being wet all day. But most of my friends who'd experienced the festival said it is really fun so I decided to stop being a wuss and attended Songkran in Bangkok for the first time... AND I LOVE IT! I loved it because everyone's wearing a smile and out for a good time. Fun is in the air. And a squirt of the water gun was all it took to cross the barrier from being strangers to friends. Words were not necessary. Our hellos were delivered in a shocking spray and an invitation to play. 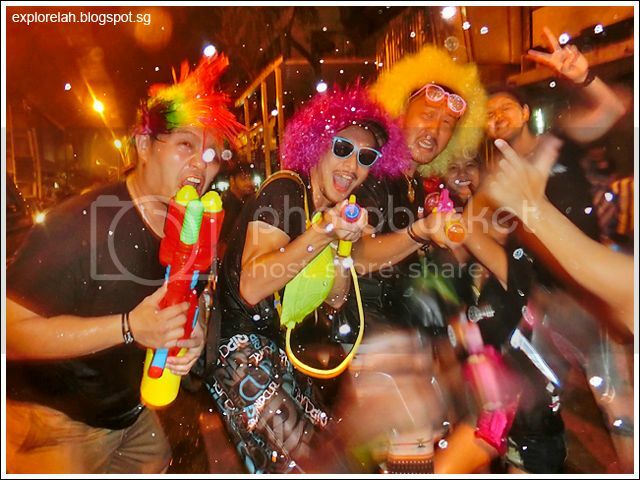 However, while it's all fun and games, there are a couple of things to be conscious of when attending Songkran. So here's my list of do's and don'ts, tips, observations and notes to milk the Water Festival for an enjoyable and memorable experience. A friend of mine got so pissed with a little girl who poured water on him that he smacked her hands. Her empty bucket fell to the floor and bounced onto an open road. That's really uncool. 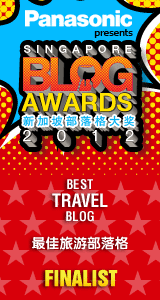 So sabai sabai, leave the attitude at home/hotel. Expect to get wet, expect to get others wet, and have a ball of a good time! Kuah si mi (are you staring at us)?! Small water pistols are useless in the epic street water battles so go Schwarzenegger instead of Lara Croft. 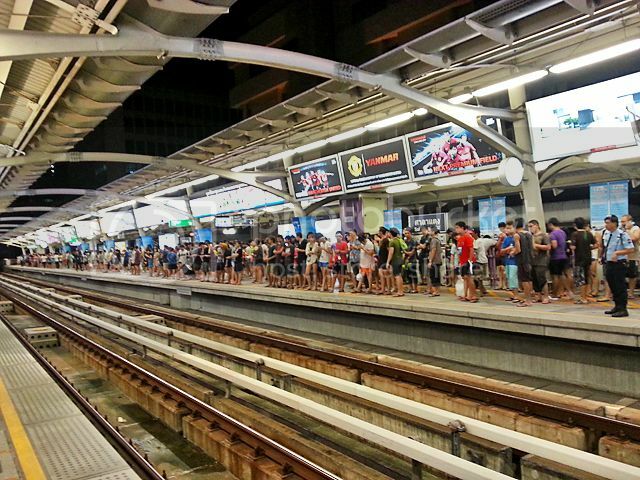 During Songkran, Silom Road (a nightlife district famous for male and female go-go bars) and Khao San Road (backpackers enclave) in Bangkok are closed to traffic except for emergency vehicles for 2 days so these places are your best bet for a splashing good time. That's provided you love squeezing amongst crowds. 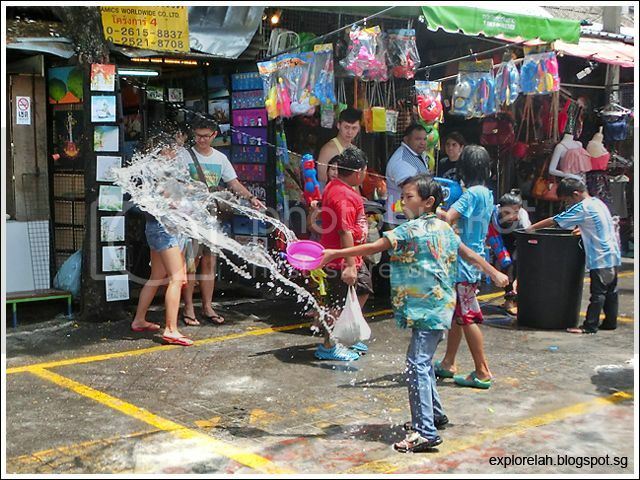 Songkran attracts a lot of visitors into Thailand so expect popular restaurants and massage parlours to be full. Some of my friends wanted to go for a massage but appointments were all booked full for 2 days. View of the crowd on Silom Road from a bridge that links to Sala Daeng BTS Station. Depending on which parts of the roads you are on and what time you visit, they can be so jam-packed with people that you don't even have the space to raise your hands. Instead of walking, you just allow yourself to be pushed along by the crowd. It can feel rather claustrophobic and one of my friends said he feared for his life as he felt a stampede could happen any minute. To avoid over-crowdedness, go to these 2 designated water playgrounds at night when the crowd thins. 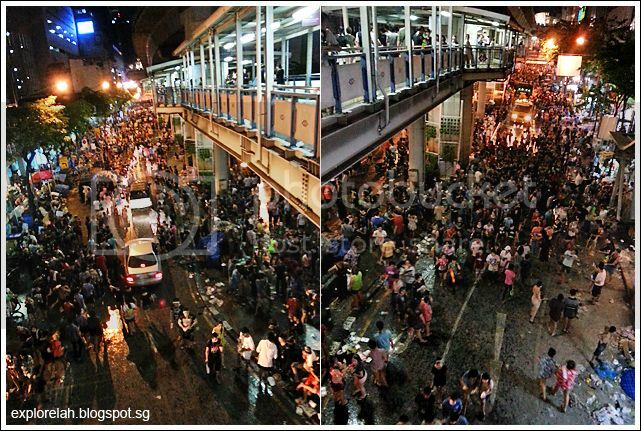 We went to Silom Road at about 8pm and the crowd was of a comfortable mass and mess. 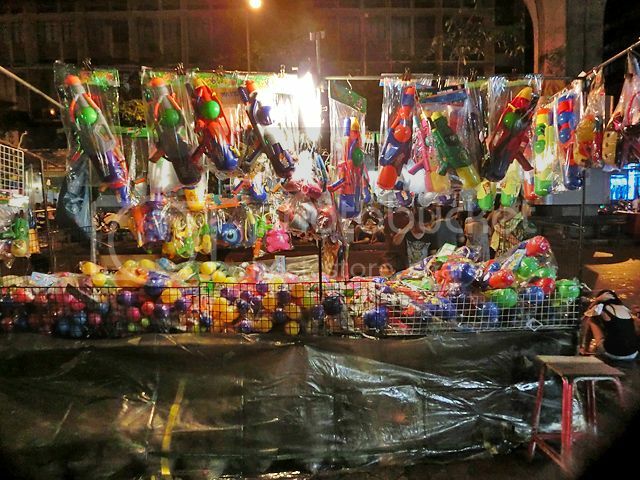 Water guns were sold everywhere during Songkran so there's no need to worry about getting one but which one to get? Get the big ones that can pump out a powerful jet with a range of up to 2 metres. Prices range from 199bht to 500bht. When buying along Silom Road, always bargain. 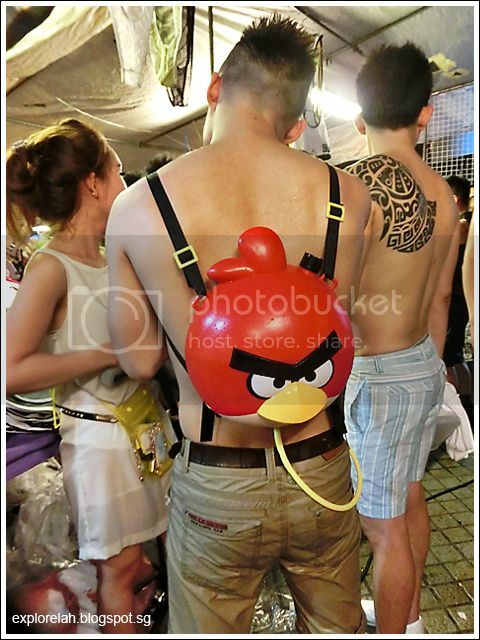 I wanted to get a Tweety Bird backpack soaker which costs 295bht at 7-Eleven but was quoted 500bht along Silom Road. Water guns and waterproof pouches are on sale everywhere. A waterproof pouch costs between 10 - 30bht each. Love this Angry Bird waterpack blaster. I almost bought it too. This guy had the best choice! 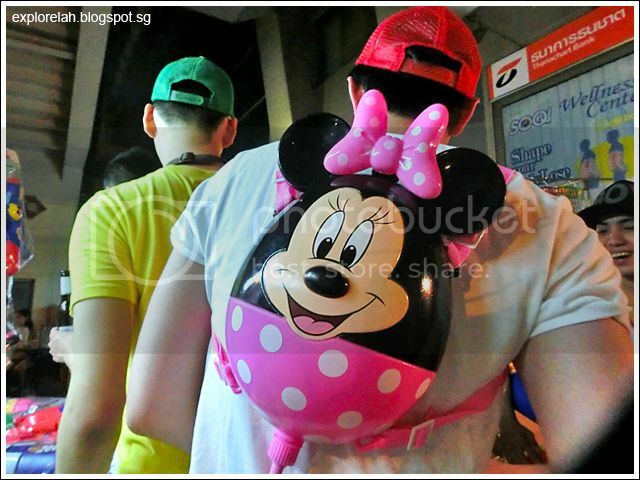 Totally hilarious to see a grown man with a teeny-weeny pink Minnie waterpack! 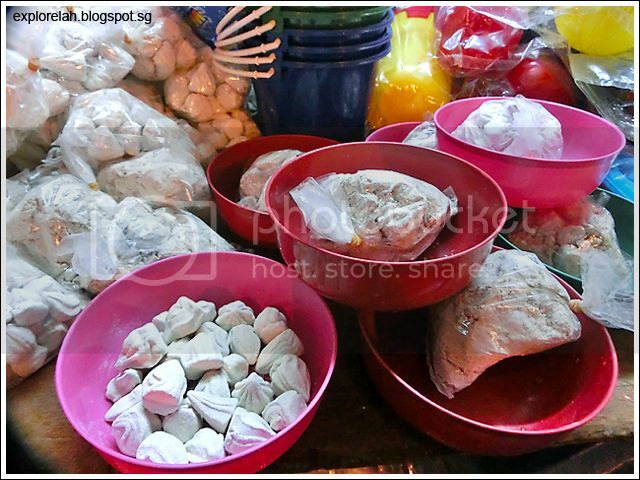 Some places such as Khao San Road has banned the use of talcum powder after men allegedly used the smearing of powdery blessings as an excuse to molest ladies. Powder or no powder, just be careful when in the crowd as molesters are lurking in the sea of people. Juliana and I stumbled onto a short street off Silom Road where loud music was blaring and decided to check out the alley party. Almost as soon as we entered the street, I felt someone giving my goreng pisang a squeeze. A couple of guys and a girl cupped my breasts chest and someone took a bite of my left triceps. Were they checking if I'm a ladyboy? The shock of being groped was rather unpleasant but the cheery atmosphere and water battles quickly replaced the irritation with elation. 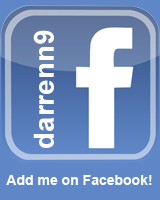 I console myself with the thought that I'm considered molest-worthy! LOL. 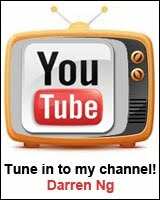 TIP #1 - JOIN IN THE PARTY! 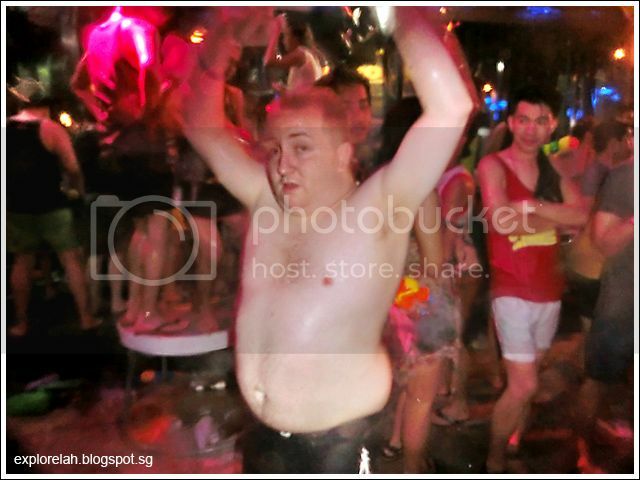 The top tip to enjoy Songkran is really to not be an outsider or observer and join in the water party. Just let go of inhibitions, wear a smile, waterproof valuables, load the soakers, and spray away! It didn't matter what's our skin colour, nationality, sexual orientation, religion, age and gender, Songkran has a power that unifies the human spirit. I felt like I was part of a great big Thai family! 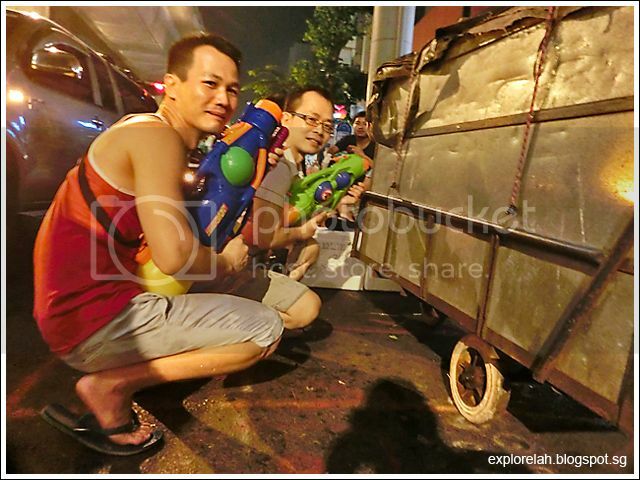 Nathan and Chee Hong doing SAF proud by deploying tactical moves to counterattack another group of shooters. I was shooting too... with a camera. No mercy! This boy kept shooting me while I shot his photos. 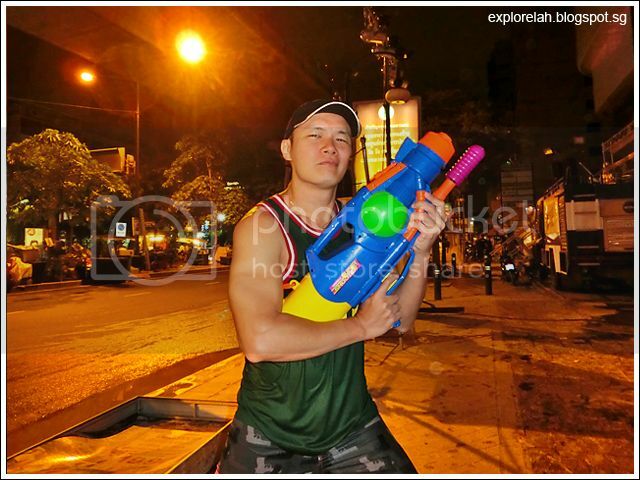 Check out the water pistol this guy is holding! ROFL! 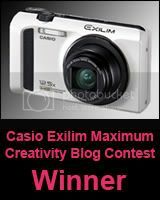 To take photos of the waterplay, I encased my Casio Exilim ZR1000 in a waterproof pouch for compact cameras. Slippers are quintessential during Songkran but wear a pair with good traction as floors get slippery with all that water. Best time to clown around! Best time to monkey around too! 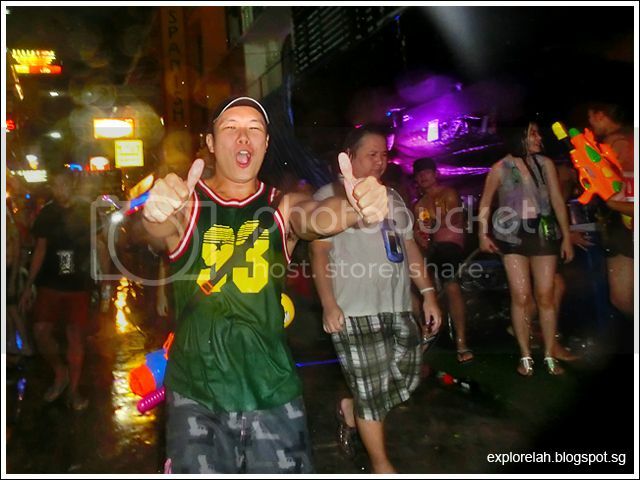 Songkran is totally awesome! 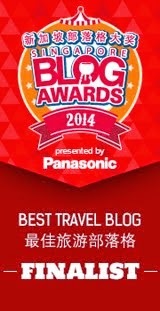 If I can, I'll come back again next year. Juliana with her see-through pink plastic skirt was a head turner on the streets. Don't play play! After experiencing my first Songkran, I'm now a convert. 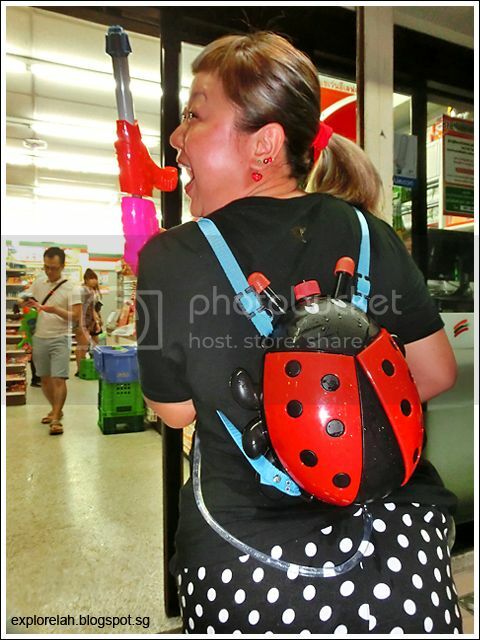 From someone who consciously avert crowds and dislike getting wet, I now can't wait for the next Songkran to happen and let loose my inner child during fountain season! 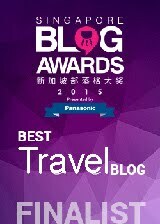 Thanks for giving more specifics than many other posts do, headed there this year!